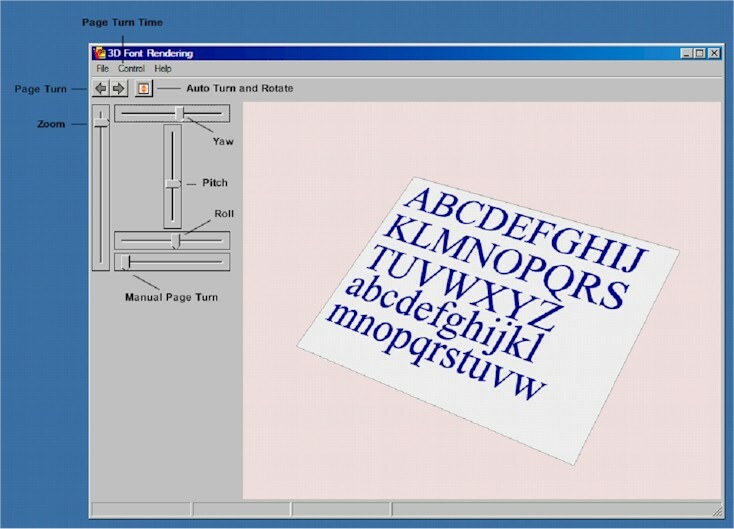 This research model is a fast processing 3D typesetter that demonstrates a continuous redrawing and smoothing of text in a moving 3D environment. Any change in orientation causes each character to be redrawn and smoothed in real time. Character heights are scalable to 1/8th pixel and smoothed to a precision of 64 shades. The typesetter redraws and smoothes the text on a page each time the operating system loop calls for a display refresh. At this point every character is recalculated directly from the font, rotated to the page orientation and rendered individually. Use the controls to change pitch, roll and yaw or to zoom in and out. Click the ‘Auto’ button to see how text refreshes in a continuously moving 3D environment. The transparent page turn is for show and can be adjusted for duration.